PartyGaming has just announced that a legend in poker is set to participate in the Party Poker Premier League IV. 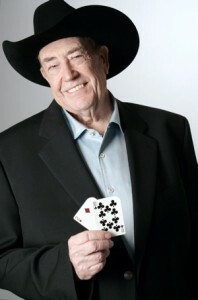 Doyle Brunson is the latest addition of poker pros to be participating in the event. So far eleven poker pros have signed up to compete and one online qualifier will be participating in the event. The Premier League IV is set to start on February 12th and continue until the 18th. The event has a buy-in of $100,000 so players will be competing to win a piece of a massive prize pool. Joining Brunson in the event is Daniel Negreanu, David Benyamine, Vanessa Rousso, JC Tran, Phil Hellmuth, Roland de Wolfe, Luke Schwartz, Yevgeniy Timoshenko and Tony G.
Team Party members will be competing for one of the two final spots. The other seat will go to an online qualifier from Party Poker. The event is going to be filled with the best poker players in the world so it will definitely be an exciting tournament. It will be interesting to see how well the online qualifier plays against the poker pros. Who knows, we may see the next new poker pro come out of the Premier League IV if the online qualifier does well.